“It’s just a compost pail! Do I really need to read a review?" Since pails made for compost range in price from $5. to $60., it would be good to know what to look for so you can determine if the expensive ones give any clear benefit, other than aesthetics. When I first started composting I used a little white frosting bucket from Safeway for kitchen scraps. It took a few weeks to realize that plastic takes on smells, even if it is lined with a bag. That is, of course, unless you take it out frequently (which you should do anyway, as explained below). And while ceramic ones won't pick up odors, they are heavy to carry out when they're full of scraps and are easy to chip when dumping. My pail for the last few years has been a lidded, stainless steel flour canister that I bought at the Goodwill for $5. It’s great - unbreakable, easy to clean and never takes on odors... but I sure wish it had a handle, because taking the compost out requires two hands, which means having to set the pail down to open the back door. I don’t mind washing out the pail after I dump it, but if I did, I would consider buying “Biobags” to line the pail with, which are compostable and can be tossed right in the compost. If you dump the compost every couple of days though, it’s easy to just rinse out the pail and then you won’t have to buy Biobags. It is important in the summer to have a tight-fitting lid to prevent fruit flies from taking over your kitchen. It's really best to take your compost scraps out to the compost bin every couple of days and mix them with some dried fall leaves, which when mixed together will make the best compost. 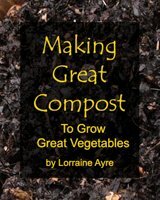 (See How to Make Compost) If the scraps stay in a closed container very long, they will start to decay anaerobically (without oxygen), smell really bad, and contain organisms that are not healthful for the soil. Even with an odor-control filter in the lid, you're going to smell it when you open it. However, if you know the pail will probably only get taken out every three or four days, then the kind with the odor-control filters might be a benefit worth having.